As a kid, I didn’t have much exposure or experience to the game of hacky sack. I probably saw the little balls in stores but didn’t know what they were. The first time I saw the game played was in a video game called California Games. But I never saw anyone actually play it until I got to college and there would always be students playing it outside the dorm lobby. And that’s my history with hacky sack, until this new game. Hacky Zack is a 2-D puzzle platformer where you must kick a ball into a goal to move to the next level. It’s available to download on Switch and PC, but reviewed on Switch here. Choose to play as a boy (Zack) or a girl (can’t remember her name). Choose levels from a book, and each set of pages represents a world. You can play any stage in a world in any order, but you must pass them all to reach the next world. Your character can jump, double jump, and cling to walls like Mega Man X. You can also kick the ball in any direction at any time. 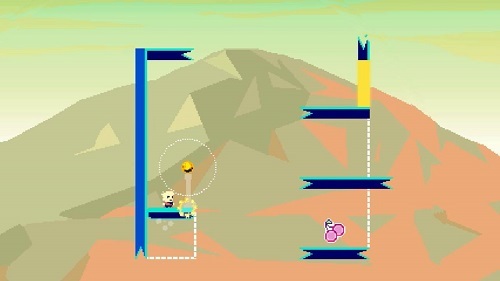 Once you make the ball reach a special yellow area, you pass the level. But it’s not that easy. You must get the ball around walls and other obstacles. In some levels there are dotted lines that you can go through, but not the ball. Other obstacles can hurt you or destroy the ball. If you run into an obstacle, fall into a pit, or lose the ball, you must start the level over again. In each level is an icon that kind of looks like a keychain. Hit that with the ball without losing it and reach the goal for bonus points. But it’s very hard to do! Speaking of which, that’s really the main problem with the game, it’s just way too hard. There is the standard Goal Mode and a Target Mode that you can unlock, but I couldn’t get far enough to unlock anything in it, that’s how hard the game is. You can play two player simultaneous, but the levels are still the same and just as hard. Although when my brother and I played it together, we did have a good laugh because whenever the girl character jumps, she shouts “Woo-Hoo!” and it sounded like Daffy Duck! Nothing too terribly violent here. If you fall off the screen, hit an obstacle, or get squished, you just disappear and start again. Reading skill is helpful for the menu text, but not necessary just to play. Younger players may get frustrated by the high difficulty, though. Hacky Zack is rated E for Everyone.